Pope Callixtus III (31 December 1378 – 6 August 1458), also known as Alfonso de Borgia (Spanish: Alfons de Borja), was head of the Catholic Church and ruler of the Papal States from 8 April 1455 to his death in 1458. He is the most recent pope to have taken the pontifical name of "Callixtus" upon his election. He was also responsible for the retrial of Joan of Arc that saw her vindicated. A member of the powerful Borgia family, Callixtus III was the uncle of Pope Alexander VI, whom he appointed to the College of Cardinals. Alfonso de Borgia was born in La Torreta in 1378. La Torreta was at the time in the Señorío de Torre de Canals (but is now a neighborhood of Canals in Valencia). At the time he was born in the Kingdom of Valencia under the Crown of Aragon. He was the son of Domingo de Borgia and Francina Llançol. He was the eldest child and his siblings were Isabel, Juana, Catalina and Francisca. He was baptized at Saint Mary's Basilica in Xativa, where he is now honored with a statue in his memory. When he was a priest he attended a sermon that Vincent Ferrer held around 1411. At the end of his message, the Dominican said to the future pope: "My son, you one day will be called to be the ornament of your house and of your country. You will be invested with the highest dignity that can fall to the lot of man. After my death, I shall be the object of your special honour. Endeavor to persevere in a life of virtue." As pope, Borgia canonized Ferrer on 3 June 1455. Borgia was chosen as a delegate of the Diocese of Lerida to the Council of Constance in 1416, but did not partake in the proceedings as King Alfonso V of Aragon was opposed to the council. Because of this he went to Barcelona as a representative of his diocese in a synod. Borgia cared strongly for the reestablishment of the unity of the church and his influence with the Aragonese monarch was the factor that allowed for the conclusion of the accord between the king and the new pope. Borgia was appointed Bishop of Valencia by Pope Martin V on 20 August 1429 and was consecrated on 31 August 1429. He authorized Pedro Llorens to take possession of the see in his name. Borgia also tutored Alfonso V's illegitimate son Ferrante. Borgia was raised to the papal chair on 8 April 1455 at an advanced age as a "compromise candidate" in the papal conclave of 1455. He took the pontifical name of "Callixtus III". He was crowned as pope on 20 April 1455 by the Cardinal Protodeacon Prospero Colonna. On 20 February 1456, Callixtus III elevated two of his nephews to the cardinalate. The first of them was Rodrigo de Borgia who later became Pope Alexander VI (1492–1503), infamous for his alleged corruption and immorality. The second was Luis Julian de Milà. 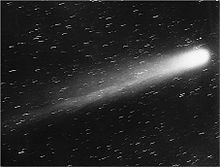 According to one story that first appeared in a 1475 posthumous biography and was subsequently embellished and popularized by Pierre-Simon Laplace, Callixtus III excommunicated the 1456 appearance of Halley's Comet, believing it to be an ill omen for the Christian defenders of Belgrade from the besieging armies of the Ottoman Empire. No known primary source supports the authenticity of this account. The 29 June 1456 papal bull of Callixtus III calling for a public prayer for the success of the crusade makes no mention of the comet. By 6 August, when the Turkish siege was broken, the comet had not been visible in either Europe or Turkey for several weeks. Callixtus III died on 6 August 1458. His remains were transferred in 1586 and again in 1610 with the remains of Pope Alexander VI to Santa Maria in Monserrato. His remains were transferred once more on 21 August 1889 in the chapel of San Diego. "Except for his nepotism, Calixtus III deserves high praise, more especially for the energy, constancy and purpose which he displayed in dealing with the burning question of the day – the protection of Western civilization from the Turkish power. In this matter he gave a grand example to Christendom, and it is to be observed that in the midst of the military and political interest which claimed so large a share of his time and attention, he did not neglect the internal affairs of the Church, and vigorously opposed heresies." ^ McBrien, Richard P. (2000). Lives of the Popes: The pontiffs from St Peter to John Paul II. San Francisco: HarperCollins. p. 260. ISBN 978-0060653040. ^ Helen Castor, Joan of Arc, (HarperCollins, 2015), 231,241. ^ Miranda, Salvador. Consistories for the creation of Cardinals: 15th Century (1394-1503) The Cardinals of the Holy Roman Church. Retrieved 29 January 2016. ^ John Stein (1913). "Bartolomeo Platina". In Charles George Herbermann. The Catholic Encyclopedia. 12. Robert Appleton Co. pp. 158–159. OCLC 1017058. "Calixtus" . Encyclopædia Britannica (11th ed.). 1911.